Eradicate a fugitive Shadowscale named Scar-Tail and bring back his heart as proof for Teinaava. Speak to Teinaava about Scar-Tail. Head to Bogwater camp, and meet Scar-Tail. Decide what you will do with him. Bring Teinaava the heart of an Argonian to collect your reward. Any time after you have finished Scheduled for Execution, talking to Teinaava reveals that he has a personal matter that he would like to discuss. Teinaava will only offer to discuss the topic if his disposition towards you is greater than 70. If you say that you are interested, he will reveal that his fellow Shadowscale, Scar-Tail, fled the Black Marsh, violating code, and refuses to return. Because Shadowscale cannot kill their own kin, as in the Dark Brotherhood, he has contacted you to do the dirty work. You are to bring back the Argonian's heart as proof. Kill Scar-Tail and take his heart. Scar-Tail's health is quite low, and therefore he is an easy kill. Find the dead assassin, take his heart (Teinaava can not tell the difference), and spare Scar-Tail's life. Scar-Tail will then tell you where his treasure is hidden. Agree to Scar-Tail's proposition initially, and then after learning the location of his treasure, kill him. Whichever way you choose to complete this quest, bringing the heart of an Argonian to Teinaava will grant you a pair of boots known as the Boots of Bloody Bounding, which have level-dependent Fortify Acrobatics and Fortify Blade enchantments (both up to 18 points). If Scar-Tail is killed before he reveals the location of his treasure, it can still be found inside the large boulder near his tent. Taking the reward before the quest is active will leave the rock empty when the quest is completed. Since the reward is leveled, this could result in you obtaining less gold than expected. You can use Scar-Tail's blood for the Vampire Cure quest. If you haven't yet started the quest, be sure to spare Scar-Tail now so you can use his blood later on. If you choose to complete The Purification and kill Teinaava the quest will not automatically end. Instead, it will be stuck at the point where you must give Teinaava the Argonian heart. If you make the quest active, the game will still direct you toward the Cheydinhal Sanctuary. It's possible to place Teinaava somewhere using the console command player.placeatme 00023E34. You can for example place him in the Sanctuary, finish this quest and then leave him there with no ramifications. One of the journal entries incorrectly indicates that Teinaava has shared the secret hiding place of his treasure. "Teinaava" should have been "Scar-Tail". If you kill Scar-Tail after the quest is completed, the quest update dialog will appear saying you need to extract the heart and bring it to Teinaava. The quest will remain marked as completed however. Sometimes the Dead Argonian Agent will not appear. After you accept Scar-Tail's alternative the cursor will point to the body. If there is no body you can save and reload and it will appear. 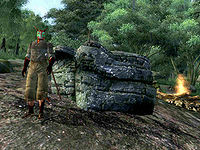 10 I must journey to the southeastern tip of Cyrodiil, to a swamp known as Bogwater. There I will find a renegade Shadowscale known as Scar-Tail. I must kill Scar-Tail, and return his heart to Teinaava. 15 I have agreed to spare Scar-Tail's life. I must take the heart of the dead Argonian assassin, and present that to Teinaava instead. To thank me, Teinaava [sic] has shared the secret hiding place of his treasure -- in the hollowed-out rock near Bogwater campfire. 20 I have obtained the Argonian's heart. I must now return to the Dark Brotherhood Sanctuary in Cheydinhal and present it to Teinaava. 30 Scar-Tail has been killed. I must now return to the Dark Brotherhood Sanctuary in Cheydinhaal [sic] and present his heart to Teinaava. 100 Finishes quest I have presented Teinaava with the Argonian's heart. It is possible to use the console to advance through the quest by entering setstage MSShadowscale stage, where stage is the number of the stage you wish to complete. It is not possible to un-complete (i.e. go back) quest stages. See SetStage for more information.